Starting off as a textile manufacturer, the company soon saw the big potential in the polyester and plastics market in a country like India. Reliance first reinvented itself as a petrochemicals company and later integrated backward to become an oil extraction and refining company. If one were to look back at the history of Reliance Industries all the way to its IPO some 41 years ago, one thing that would stand out is the way the company has redefined and reinvented itself over the years. While petchem still continues to be its staple business, it is refining that really contributes to the bottom-line of the company. In the last 10 years, Reliance Industries also realized that its focus on fossil fuels will have a limited shelf life and it needed to come up with a big idea to sustain for the next 25 years. It is in this context that the 41st AGM of Mukesh Ambani-led Reliance Industries Ltd. assumes special significance. “The future is now” is exactly what Ambani conveyed to his shareholders, and to the world at large, at the 41st AGM of RIL. “Over the next 10 years, the consumer business of the Reliance Group alone is expected to generate as much as the petchem and refining business put together,” Ambani had said while addressing the shareholders. As of now, retail and Jio already account for 13.5% of the group’s EBITDA. Ambani has also announced that Jio has doubled its subscribers since the last AGM to 21.5cr. Jio now has the second-largest number of subscribers after Bharti Airtel. It has also overtaken Idea and Vodafone India along the way. But the big story of the AGM was not about the Reliance Jio numbers at all. It was about the new future for digital that RIL has been envisaging. At a strategic level, there were three key shifts that were sounded at the AGM. This was what the market was actually waiting to hear. 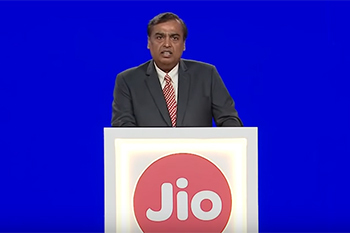 RIL announced that Jio will be leveraging its wired broadband network across India to launch Jio GigaFiber. RIL has already invested close to $250mn and this service will be extended to 1,100 cities and towns across India. This will result in a faster internet usage experience at a lesser cost. The big target audience for the Jio GigaFiber will be individual homes and small businesses. For small businesses, it will mean a competitive edge to take on the larger players with deeper pockets. For homes, it may mean a complete virtual experience, where almost everything can be technology-enabled at a very reasonable cost. This is the next big growth area for Reliance Jio in particular and for RIL in general. If one were to break down the text of the RIL’s 41st AGM, the second highlight was the group’s big bet on media. It is not just the media properties that they own and the properties that they are looking at. The highlight was the way the group is approaching media from a different perspective altogether. There are two things to note in the media play. Firstly, media for RIL will be seen as a forward adjunct to its broadband connectivity. Thus, the logical outcome of the Fibernet will include home surveillance, home automation, landline, cable TV, and broadband. Effectively, your TV also doubles up as your computer and your mobile will also double up as your movie theatre. All this will come at a salivating cost. This will be the infrastructure part of it. The second leg was narrowcasting of content. With its ownership of the CNBC and Moneycontrol properties, RIL already has control over every second TV viewer and every fourth internet user in India. Combined with a little bit of artificial intelligence and big data, the Jio GigaFiber can actually download your favourite show and movies right down into your mobile phones, laptops, and even your TV sets. The AGM has also aggressively focused on how RIL has emerged as an environmentally conscious business. This perfectly gels with the reduction in the relative share of fossil fuels in its overall business mix. A model that is predicated on fossil fuels and other unsustainable forms is unlikely to get good valuations. Companies around the world are realizing that for a business model to be future-perfect, they need to focus on sustainable means and manage the risks of unsustainable means. For starters, RIL is already the largest recycler of PET bottles in India. The Jamnagar unit is already producing the largest amount of globally efficient ethylene cracker. The company has started maximizing its oil-to-chemicals conversion and upgrade all its fuels to high-value petrochemicals in the years ahead. When you combine this managing of fossil fuel risk with the foray into retail/telecom, the big picture becomes a lot clearer.